From the bustling McDonough Makerspace to the high-tech classrooms to the welcoming café, WPI’s distinctive project-based approach comes to life in the Foisie Innovation Studio. Here, students, faculty, staff, and industry and community partners gather to delve into the whispers of “what if… .” Atop the Innovation Studio, Messenger Residence Hall promotes integrated living and learning. Monday - Thursday: 7:30 a.m. - 12:00 a.m.
Friday: 7:30 a.m. - 1:00 a.m.
Saturday: 8:00 a.m. - 1:00 a.m.
Sunday: 8:00 a.m. - 12:00 a.m.
Sunday - Thursday: 10:00 a.m. - 11:00 p.m.
Friday - Saturday: 10:00 a.m. - 1:00 a.m.
We welcome input regarding the content featured on the large feature wall and the vestibule display screen in the Foisie Innovation Studio. If you are interested in sharing new content ideas for the digital screens, please complete this input form to submit ideas. Visit Foisie Innovation Studio digital screen governance for more details on content, publishing and use of these screens. Planned to encourage open minds through open spaces and the right tools to realize a vision, the distinct areas arranged within Foisie Innovation Studio’s 78,000 sq. ft. area will spark ingenuity. Check out the information display at the Quad entrance for a stream of weather, news, social feeds, activities, stories about donors, and WPI announcements. 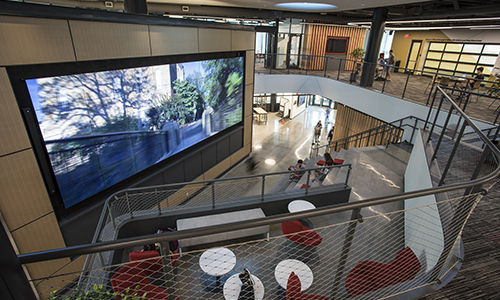 At the two-story video feature wall, take in the compelling and inspirational visual representations of the WPI Plan ideals. See the places we send our students around the world, stories and activities of students and alumni, and the complexities of our science and technology scholarship. Additional space for active learning classrooms welcomes larger groups and more opportunity for students to engage with the curriculum and each other. A global education is a WPI hallmark, and the Global Lab brings together project-based learning, digital storytelling, and engagement with our partners around the world. Here, we explore how audio/visual tools and emergent media technologies can deepen collaboration, expand the impacts of global partnerships, and provide new opportunities for reflecting, learning, and sharing. This space aligns entrepreneurial activities across campus and across disciplines and connects WPI innovators to commercial and venture capital opportunities. Whether seeking advice, bouncing ideas around, learning from failures, or celebrating successes, the expertise, camaraderie, and resources here will stimulate innovation throughout the WPI community. Like Alumni Gym that stood in this place, this building—and the opportunities it holds—is made possible by the generosity and vision of alumni donors and other friends of WPI. Our donor wall located at the main entrance off the Quad acknowledges the people and organizations who have helped make the Foisie Innovation Studio a reality. We are grateful to them all.